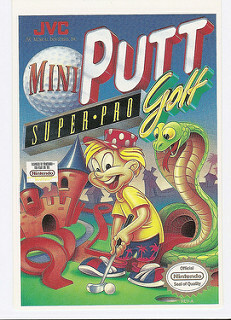 Mini Putt is the planned English translation of the Famicom-exclusive mini golf game of the same name. A prototype was put up for auction on Ebay on October 3, 2015 at a starting price of 99 cents. The listing ended on October 13, 2015 at $1,525. It is unknown who won the auction, and the ROM has never been dumped. The Mini Putt VidPro card. ↑ "Whatever your handicap, you'll enjoy all the charms of Mini Putt miniature golf. Avaliable Fall '91" GamePro, October 1991[page number needed]. ↑ Ebay. Retrieved March 20, 2016. This page was last edited on 1 July 2017, at 08:14.